Because of a motion put by Deputy Mayor Suzanne Séguin, the installation of a Water Park on Cobourg’s Beach was raised at Monday’s Committee of the Whole meeting. Although Council agreed last year to approve the idea, installation did not happen last year and no contract has yet been signed. Jason Pulchinski, President of ATL (At the Lake), the distributor of the equipment, made a presentation to Council and triggered a good debate on the subject. He explained that last year they had tried to partner with the YMCA to provide lifeguards but that did not work out. They did manage to hire 5 but they needed 10 so that 4 could be on duty at all times. It was not clear until May that the YMCA partnership was not going to happen and by then it was too late to recruit the number needed. Jason answered many questions about safety and liability and said that he had a good relationship with staff – that is, Dean Hustwick (Director of Community Services) and Teresa Behan (Deputy Director of Community Services). He said that the planned contract would be zero cost to the Town (see links below) with a big tourism benefit including Downtown and overnight stays. The Operator has $10,000,000 liability insurance coverage. The same operator currently operates a Water Park in Muskoka. The daily cost of $35 is comparable to other activities like canoeing, skiing, Canada’s Wonderland. The Park would be expected to operate for only about two months in summer during which it would provide “good clean family fun”. The park occupies about 10% of the beach. Although it has not operated previously in a large lake like Lake Ontario, it will take special precautions against strong winds and large waves. A report of a child injured in a similar park in Barrie was not related to equipment. A boy had held his brother under water. ATL has not yet partnered with local entities. Suzanne Séguin questioned the business case – at $35 per user/day, 132 users per day would be required. Jason said that based on their experience, this is fairly realistic. Suzanne said she was concerned that the money spent by users was money that did not go to the Town but instead went to the Water Park. Jason responded that the Town could always buy the equipment themselves although they may not want to take on the risk. Equipment has a life of about 5 years. Despite an ad in Muskoka saying that lifeguards would be required to sell passes (and that would be a disincentive to take the job), Jason said that this would not be the case in Cobourg. When asked if ATL had done an impact study, Jason said that he assumed the Town knew what to expect. Brian Darling supported that and said that the Park would have less impact than other events. Adam Bureau asked what would be on the beach – it would be a 10′ x 10′ tent to house lifejackets. Emily Chorley asked “Do we really want an ‘amusement park’ on our waterfront”. Suzanne Séguin said that it was not part of the vision for the waterfront. In the end, Council asked staff to report back by February 19 which should be soon enough for the contractor if there is a decision to proceed. Dean Hustwick wanted to know what exactly was wanted in the report since he had already reported extensively on the subject. Suzanne referred to the motion (asking for “financial implications, safety concerns and legal impacts”) plus she pointed out that Councillors had not seen the RFP nor the proposed agreement. She also asked about any special requirements for use on Lake Ontario. The motion carried – so there will be a report and presumably a decision on February 19 which is a Committee of the Whole meeting date. Sign us up for the waterpark. summer. No more stalling. Maybe, it time for the Mayor to show some leadership. Marc, It is up to ATL to hire the required number of lifeguards. They failed to do this last year and unless they are able to do so this year there is no way for the Waterpark to be operational. This is ATL’s issue to resolve, not the Town’s. Our Family wants a Waterpark on Cobourg Beach. downtown” are meant to undermine this project. Susan Sequin has been negative on this subject since Day One.. Since when is it a Sin to make a profit on providing a good project to the Community. It is hoped a more positive tone will be forthcoming from other Councillors. Profit is not a sin! However, changing the character of our beach without public consultation and approval should be considered a crime. We spent over $100K to determine what Cobourg residents wanted and a waterpark was never mentioned. Hi Jason, This is Ted from TorontoAdventures.ca Many years ago we went through the same process with the City of Toronto. it was a very difficult time. We now have been providing kayaking, canoeing and SUP services for many years enabling over 10,000 participants a year to enjoy Toronto’s beaches. The process to get Government approval is very difficult since they do not like nor understand private business and that private business is the only way to cost effectively run such a operation, growing the local economy and providing needed youth jobs. Waterpark is great idea. Its for Families and about Fun for Kids. Thats all ! Surely NEW Council will not SMOTHER this project with phoney safety issues and financial concerns. While were at it, lets get on with repairing East Pier THIS SPRING ! Phony safety issues? Financial concerns? Why yes, those are exactly the things that need to be considered by our new Council. Private business doesn’t care about Cobourg; they only care about their own profit/loss statements. At the end of two months, they walk away. What happens at our beachfront is of intense interest to Cobourg residents and I would assume Cobourg Town Council. Good on you, Deputy Mayor Suzanne Seguin, for asking the tough questions and requiring a considered response. If ATL hasn’t bothered with an impact study but rather says “Cobourg knows what to expect”, it means they haven’t done their due diligence. Is that who we want to be in business with? With the global focus on plastic pollution and single use plastics I think a floating plastic park is backward thinking. It’s inflatable, so one tear and it’s likely headed to the landfill. Young folks need good activities…how about more canoes, kayaks, SUPs, paddle boats which have yearslong shelf life and provide some real physical activities. No to floating plastic it’s not sustainable! “Stand up paddle boarding (SUP) is the fastest growing sport in the world…” for those, like me, who didn’t know until know. Cobourg has two assets that distinguish it from most other Ontario small towns – a harbour and a beach downtown. Reading the posts from the usual suspects, one has to conclude that the beach and the harbour are a liability and should probably be turned into nature preserves. Big Boaters and beach goers cause nothing but trouble. If kids want to swim, they can dive off of a dock at the cottage like regular folks. And sailing is sort of elitist too. Why can’t the boaters just be happy with an aluminum boat with a good Evinrude outboard motor? Kids having fun? No Way! Cobourg is a retirement community. and how about this one in Quebec? indoor winter fun for the whole family! Mr. Luedekte. Respectively, in my opinion you have missed the point. There is a significant safety difference between an indoor pool facility with a water slide contained in a small area, and an inflated water park in open Lake Ontario. I attend those volleyball tournament. I assure you that many of us do dine on King Street, and others do not. Businesses who pay the overhead to be there do so of their own volition. If the product is good they shouldn’t have any issues. They should be welcoming the increased foot traffic that a waterpark would bring to the beach. I find it fairly ridiculous to REQUIRE tourists to financially contribute to businesses when visiting any city. Again, if a business is promoting itself properly and has a quality product then again there shouldn’t be an issue. It would appear that although some look forward to progress, they also fear change. 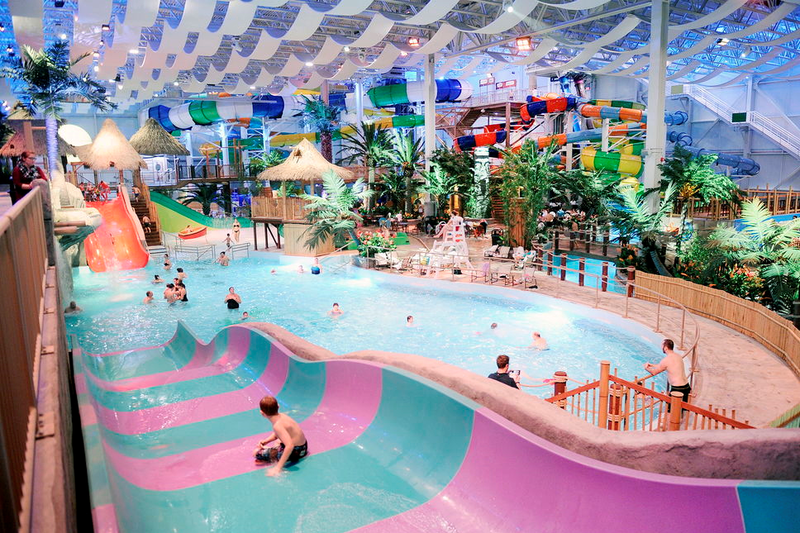 I hope this waterpark happens I think it would be wonderful for the city of Coburg. The water park will be floating off the beach in all its primary colours even when the beach is vacant of kids and families. We will be looking at it on our early morning and late evening walks, overcast cool days…and that will definitely detract from the beauty of our town and our Great Lake. Why not give it a try for one summer and see how it goes? are really going to be shopping and dinning on King st .
And why should they, the attempt to tie recreational opportunities to downtown restaurants is simplistic and unworkable. Do we really want them to? If they are dining on King St., the restaurants are earning all the profits and paying a small portion back in property taxes. If we can keep them eating at the canteen, taco truck and weenie cart, the town is guaranteed at least $15,929.20 (was supposed to be $20,000.00) in rent or half of the profits (whichever is greater). I can only imagine that after the great weather, huge waterfront crowds and the Cobourg Beach Courtyard weekends that we made a killing on the 50/50 profit sharing plan last year. Although… I haven’t been able to find those numbers anywhere yet. Maybe some of you research/sleuth types can help us out. Most of the restaurants on King Street pay very high rents. . Their landlord is responsible for the taxes. The restaurants on King Street employ staff. Cooks, wait staff, cleaners etc. Most of them live in Cobourg and all of them need to be paid. Business is slow during the winter so they need the tourist bucks too. 50-50 “profit sharing” is quite different from 50-50 SALES sharing. The busier, the more staffing requirements, etc, etc. Busy does not always translate to more profitable. “Killing” just might not be the best conclusion to be drawn. We have a great beaches, a beautiful park and superb harbour. The features we now have attract a lot of visitors and will for years to come. Sure it needs some maintenance, tweaks and upgrades now and then (east pier), but we have to learn to like our waterfront. If town staff feels the need to monetize anything, have them spend all that energy and creative thought on the CCC or our decaying downtown. Ok, Debbie Fox, tell us one or two better ways to monetize our waterfront. Wally, there is no need to be confrontational. If you disagree, then click on the thumbs down icon. You have your opinion and I have mine, as is my right. Ok, I apologize for daring to ask you a simple question, even though I have the right to ask a question. If you don’t want to share any of your ideas to monetize, then that is your right. Btw, like you, I am a proponent of monetizing the waterfront, so there was no notion of confrontation. If there were far fewer tourists there would be little need for Cobourg to monetize our waterfront. So how do you propose to reduce tourist visits in spite of Cobourg’s century-plus as a tourist town? I have a deep connection with born and raised Cobourgers and the majority don’t share the anti-tourist attitude that you espouse. I tried to listen to the presentation from ATL and the Q & A that followed but the sound was so bad on the Cobourg web site I had to give up. Who’s in charge of the audio/video recording of these council meeting? Get them some help or let someone else try. I was able to watch the live feed from someone other than the town set up and despite turning the camera to the speaker the sound was far better than the Town production. The two staff gentlemen on the back row one on either side of the aisle need to speak up especially the person on stage left both their microphones seemed to interfere with the phone feed. All in all, I prefer this feed over the Town’s which I find amateurish with its fixed camera angles and less than adequate sound system and cheap production. Gerry, Thanks for helping us find this on ‘Facebook’! Much better sound quality on this venue! Audio only had a ‘hum’ when the ‘mic’ that was used by the gentlemen, in front of the ‘press desk’, was on? The Facebook Feed was created by the Town’s Communication Officer, Ashley Purdy, hand-holding a tablet to create the video. She is to be commended for providing a better quality feed once it was apparent that the regular one was not working properly. She is aware of the need to fix the regular video system with its poor sound. Those making the most profit will be the operators of the water park. $35 per person is extremely high and as a result it is most likely less will accrue to the local stores/shops. I have seen one water park like this at the Sandbanks and a family member has tried one in the Dearhurst area. The conclusion was they are/were not that interesting, exhausting after 20 minutes due to their nature, quite often kids were out of the site-line of the life guards, too expensive, and not a lot of fun, with safety concerns for younger kids. In my view this type of venture is not an advantage to Cobourg and detracts from the quality and safety of the beach as the two noted were on inland lake/areas and not exposed to an open lake such as Lake Ontario. The Waterfront Plan provides the vision for everything waterfront. Why was there nothing about a waterpark in the questionnaire? I don’t recall a mention of a waterpark at any of the public meetings. Does anyone actually want a waterpark? With luck, Old Sailor’s 50km winds will quickly destroy the proposed abomination. It’s an abomination because it would provide jobs for summer students to earn their college/university tuition. It’s an abomination because it would generate income for Cobourg to pay its bills, eg east pier repair. This anti-tourist attitude goes against the grain of Cobourg’s long and valuable history as a tourist town. It is the attitude of effete snobs who want to live in a gated community — keep them abominable outsiders out of our town. Thankfully, such a nightmare will not happen. Let the tourists arrive. Let our young people, students, meet and mix with other young people from outside Cobourg, particularly from the GTA. It gives our young people an opportunity to network with new friends and help gain a foothold perhaps sharing a flat for university. It worked well when I was a student here, and same for other young people, and I dare say, it goes on today. You’d have to grow up in Cobourg to know about this phenom. Wally, I think “that Cobourg” has slowly morphed into a place now dominated by attitudes that were born of other places less affable. The irony may be that it was/is that affable nature of times past that actually attracted the attitudes we now see as more prevalent today. While we may pine for “that Cobourg”, we are now dealing with a different and irreversible character change and nuthin’s gonna change back. I sometimes wonder how many of our policy makers and their advisors are native Cobourgians and how that affects the direction the town plots for the future. For myself, there was a time when I could pretty well recognize just about anybody who was going down the street, even just by their walk, but now I’m lucky to just “recognize” only the odd one, never mind their gait. C’est la vie! I find your comment quite agreeable, but this is what I regard as hopeful; tourists from the GTA, especially immigrant and 1st generation Canadians. The secret is out among many cultures in south-central Ontario. There are many videos on YouTube of assorted GTAers visiting Cobourg. It’s a big deal for them. All of the videos were a bit of a love letter. One bunch of young people left Scarboro, drove into Cobourg Walmart and bought $247 worth of groceries for their weekend stay. Others made video of going up to the downtown and browsing. Summertime is when multicolourful people come to multicolourful Cobourg and they will continue to come here because it is so goood. Furthermore, when young people in our time networked with visiting young people, it was not as rich with possibilities as it is today because of all the available cultural diversity now. Resistance is futile and a waste of time. Entice them to spend spend spend. Good point. None of the reports have checked to see if kids actually like to use a waterpark. And for what age group is it supposedly suitable? I agree with all the others that the Waterpark is not the kind of trash we want on lakefront. MBY, you sound as silly as Walter. ahh – just a little venting Frenchy…it can be exhausting listening to people who poo-poo every idea just because its new or different or because they can’t see a “benefit to the town.” Doing things that bring joy to people is a benefit – as intangible as that may be. There must be a financial benefit to providing a service because providing services is expensive. Money goes out from the town budget, money must come back in. To think otherwise is naive. I’ll have to disagree with you on this Debbie – it isn’t all purely Capitalistic. Where is the financial benefit to the lighting the park or lining King Street lights during the Christmas season. Most recreational facilities do not make money yet imagine Cobourg without Legion Park, Monks Cove, the CCC or the Fink. Here I thought we were the “feel good” town – feeling good isn’t simply about monetizing everything we do or every service having a clearly defined financial ROI. Sometimes things are literally done with the benefit being more intrinsic in nature that make people feel good about where they live or enhances the quality of life for current residents OR potentially attract new people as a result of the feeling the town gives them (but how do you measure that). Could be that I’m naïve…#unlikely. b/c ? That means “because”, right? Hi folks… yep..biased a bit. I know the ATL owners. Many thoughtful points raised for sure. Business ideas come out of need-or there would be no point. ATL is a husband wife team with 4 children. Their love of water products like this comes out of seeing kids (and yes, adults too) enjoy the water. My own family of four have enjoyed years of it. While we want kids to be in nature, enjoying the breeze, the sun, the fresh air- this is preaching to the choir! Getting those otherwise-not-engaged families out is really the goal. This becomes a great conduit for connectin fun, fitness and the great outdoors. The commenter that has been to a couple – yep- its a workout! Exactly what kids in the summer need….give it a chance and see. I will have my own family of four on it in a heartbeat. Getting those otherwise-not-engaged families out is really the goal. That seems a questionable goal for someone who wants to be a successful entrepreneur. Perhaps those in favour of the water park can explain where the additional parking will be provided for the increase in daily beach and water park users. Providing additional parking for increased waterfront events is the Achilles heels of previous town planners. Difficult to imagine the water park surviving in 50km winds from the south – which do not occur in the Muskoka Lakes. Is the net dollar benefit to Cobourg enough to justify more congestion by the waterfront? Is the net profit to the town guaranteed? “additional parking” perhaps one idea, as outlandish as it might seem at first glance, could be FREE public transit within the town limits. Currently the ridership revenue collected annually comes in the neighborhood of $160,000, (less than 14,000 per month) not a notable sum considering both the transit and town budgets on the whole. FREE transit might bring with it some minor increases in general expenditures but the extended potential savings in parking related expenditures plus some creative revenue tools other than fares could replace that loss of revenue while providing a number of huge benefits to ALL citizens of the town throughout the year on an ongoing basis. That could include a very notable impact on traffic in general all year and during many events, thus taking some pressure off the ever-present parking issue. I know, long-winded reaction to your “Providing additional parking for increased waterfront events” concern but worth a look. Sure, why don’t we just give everything away for free? Who’s going to pay for it then? We’ve already got the majority of tourists coming to our beachfront without spending a dime in our town. Tourism is supposed to be more than an influx of people; it’s meant to create a stream of revenue, reliable and dependable revenue on many levels. Parking, restaurants, transportation, bike rentals, food trucks, retail outlets on King Street and beyond. Otherwise, all we’re doing is creating more garbage, more full garbage cans (for those who actually use them), more policing, more bylaw enforcement. More expenses, no more income. That is a recipe for disaster for Cobourg. Free parking stickers for residents and much higher parking fees for visitors (coupled with tows for overtime parking) would go far to remedy the current problems. And to think, the town spends money on advertising in order to have to spend more on garbage collection! Perhaps your businesses should re-think the marketing plan and the quality of their products. Speaking of traffic congestion, I’m challenging Nic B., Emily C., Aaron B. Adam B, Brain D. the DM and the M to fix that traffic flow disaster at Cobourg Colligate Institute and C.R Gummow. I dropped my child off this morning at CCI and it took more than 10 minutes to exit the parking lot and head west on King Street – it was only luck and kindness that allowed me to exit when I did. Luck, hope and kindness are not strategies. The previous Mayor failed to acknowledge this as an issue in any meaningful way. You can not consolidate 2 schools and increase population density without appropriately augmenting traffic flow and controls. I’m all for free transit for specific parts of the population however not convinced it will do much to alleviate this issue. Many areas of Cobourg are far from a bus stop. There is no service to most of New Amherst. There is no service to East Village. I live more than 2km from the nearest bus stop. Providing a 15 minute wait service to everyone would cost at least twice as much as the current bus service. Maybe we should look at Uber, as Innisfil has done. Very positive results there.